I had fun playing around with ideas for this self portrait. I wanted it to be positive, reflecting the sense of contentment and gratefulness I feel at the moment. I have so much to be thankful for, not the least of which is an amazing husband and beautiful son. So I chose colours that make me happy, particularly the floral fabric in the background. The image is painted on the glass – partly because it was fun, but also because I didn’t want my portrait to be encased or suppressed by the well-meaning protective glass… Yes, I guess that’s metaphorical.The one thing lacking is a mouth. I just haven’t found my voice. Of all the things that I am – a woman, a mum, wife, friend, colleague, student, there’s so much more that I want to be and so much I want to say. But my voice has wandered away for the moment. It’s probably found a hatter’s tea party and is busy pondering the all important questions of life “why IS a raven like a writing desk?” But that’s OK. I’ll catch up to it, eventually, and when I do, I’ll be ready for it. If nothing else, becoming a mother transforms most women, in how they feel about and see themselves. Women can experience this stage as both vulnerable and empowering, as they negotiate contradictory feelings of separation from, and connection to, their babies and children, and work towards integrating their experience as a mother with their identity as a woman or person. Welcome to week 3 of ‘A Month of Mothering’! Motherhood has often been described as a roller coaster, with ups that are high and downs that are low. Experiences of joy and challenge are a part of most mothers lives, whether it be daily, weekly or over a year. This week is an opportunity to reflect on specific joys and strengths and also specific challenges you may face as mums – often at the same time! 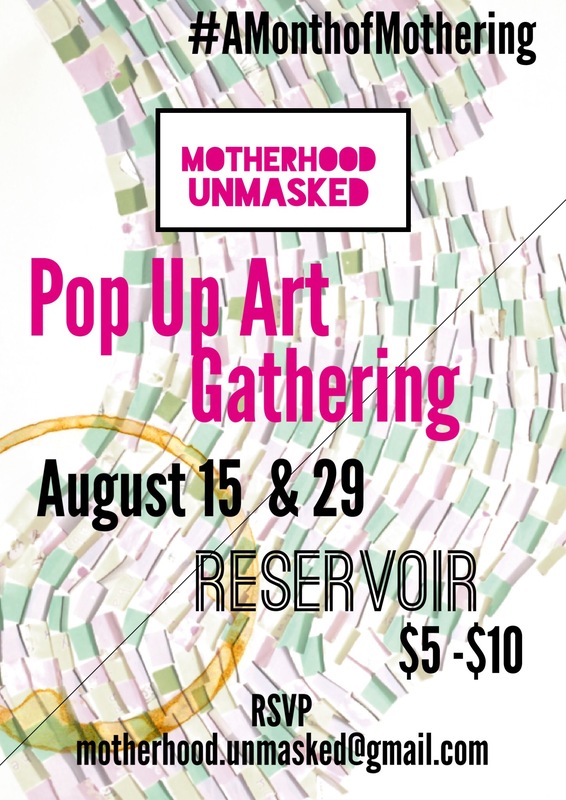 Join us in person if you live in or around Reservoir for a pop up art gathering – to be held on Monday 15 and 29 of August at Reservoir Neighbourhood House. This is your opportunity to reflect on your experience as a mother, stretch some creative muscles (as much as you feel comfortable) and connect with other mums who participate.